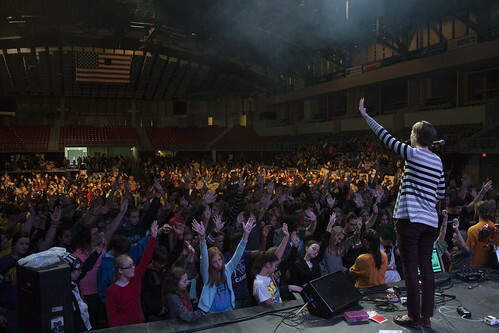 More than 1,200 young people from throughout the Great Plains Conference came together Jan. 30-31 for the youth event of the year, The OneEvent. The 2016 OneEvent, Pyromaniac, was – for the second year in a row – hosted at the Heartland Event Center in Grand Island, Nebraska. The OneEvent featured seminars, musical comedy, worship, messages and a concert. The youth who attended came all across Kansas and Nebraska, with each of the 17 districts being represented. Out of the registered churches, those who came the farthest include the Kansas churches of Hugoton, Frontenac and Thayer United Methodist churches. Youth from those churches traveled about six hours to join in worship, fellowship, mission and just plan hang out with youth they wouldn’t get the chance to meet otherwise. On Saturday, Jan. 30, before the first general session kicked off, youth were greeted with vendors, games and activities. Campus ministries and camps were some of the most popular booths. Eian Lewis, a freshman from Shawnee Heights United Methodist Church in Topeka, Kansas, said his favorite part of The OneEvent was the college booths. He was already in the planning mode. Freddy Ford, also from Shawnee Heights UMC, said his favorite part was the environment in general. “It’s a good way to feel comfortable and have no stress in a Christian atmosphere,” Ford said. The Rev. Nicole Conard, Great Plains Conference coordinator of young leadership, said the event gives high school students a chance to think about college and how to continue to have faith opportunities when they leave home. Read how the youth helped assemble 500 health kits for UMCOR. Outside of the vendors and activities, the youth were able to come together during worship and general sessions and break out into five different seminars throughout the weekend. In addition to the youth leader seminar, there were five other seminars for the youth to hear a specific message: High Def Passion (led by Ground Zero Master’s Commission), On the Rebound (led by Ground Zero Master’s Commission), Comedy as a Ministry when it doesn’t look like a ministry (led by performers Dave and Brian), ASK: Faith Questions in a Skeptical Age (led by Bishop Scott Jones) and Spread the Fire! (led by Steven Nick Talbott). Amanda Drury, PhD, assistant professor of practical theology at Indiana Wesleyan University, lead the Saturday afternoon session with talks on how God doesn’t give tough love. He doesn’t give just love. He gives crazy, unnecessary love. She used readings of the Prodigal Son as a leading example of how to love. Saturday night, Drury shared that some things in life are like bricks, and there are two types of people: those who throw bricks and those who catch the bricks to build a wall to protect themselves. She challenged the youth to be a third kind of person – one who uses bricks thrown at them to build a path back to the brick thrower. “Work on forgiveness and forgive people as you feel safe and comfortable with,” Drury said. On Saturday and Sunday, the youth enjoyed music by worship leader, Zealand Worship, musical comedy by Dave and Brian, and on Saturday night they celebrated with a concert by The City Harmonic. The Rev. Lynn Lamberty, from Highland Park United Methodist Church in Topeka, Kansas, came to The OneEvent with 11 youth and a youth leader. “This is a good place (for the youth) to be with other Christians and others of the faith,” said Lamberty. This story was written by Rachel Moser, communications coordinator for the Great Plains Conference. Reach her at rmoser@greatplainsumc.org.